This week we will be starting the new year off with a dinosaur I have been meaning to get to for months, actually, but new discoveries and requests kept taking preference. So finally let's say hello to a little dinosaur that was one of the first to ever be scientifically described, Hypsilophodon foxii! Life restoration of Hypsilophodon by Christopher DiPiazza. Hypsilophodon was discovered in what is now Southern England during the Early Cretaceous period, between 130 and 125 million years ago. It was a plant-eater, and adults measured almost five feet long from beak to tail. The genus name, Hypsilophodon literally translates to "High-Ridged Tooth" BUT this is in reference to the scientific name for a modern kind of iguana, Hypsilophus, which has a high ridge of spines growing down its back. Hypsilophodon's teeth didn't have any sort of ridges on them...but they were similar to the teeth of modern iguanas, which is why it was named what it was. (like how Iguanodon was named) Hypsilophodon was a small member of the ornithopod dinosaur group, related to Iguanodon, Tenontosaurus, Mantellisaurus, and to a lesser extent, the duck-billed hadrosaurs. Hypsilophodon skeletal mount on display at the American Museum of Natural History. Hypsilophodon was first discovered during the mid 1800s so it was among the first of the non-avian dinosaurs to be recognized by modern science, shortly after Iguanodon and Megalosaurus. Like them, Hypsilophodon went through a few changes to its identity as scientists gradually learned more and more about it. Originally, it was actually believed by some to be just a small Iguanodon, and then a smaller kind of Iguanodon. After finally confirming it was a separate genus, Hypsilophodon was believed to have been a tree-climber, since it was small, lightly-built, and since scientists at the time thought it could have used its first toe on each foot as a sort of perching digit, like what you might find on a modern song bird and its tail may have been prehensile to grasp branches like that of some monkeys. Upon further examination, however, it was found out that Hypsilophodon's first toe was more like a dewclaw, and therefore, was unable to rotate around and grasp something like a branch. Its tail, in actuality would have been stiff, not flexible, due to the presence of ossified tendons found down its length. In addition to the arboreal idea, the idea that Hypsilophodon could have hopped like a kangaroo to get around was also entertained for a while, since its feet were indeed very long. Scientists have since concluded that it most likely was simply a very fast runner, and did so like modern ostriches and emus. This would have enabled it to escape the many predators it coexisted with, like Eotyrannus, Baryonyx, and Neovenator. 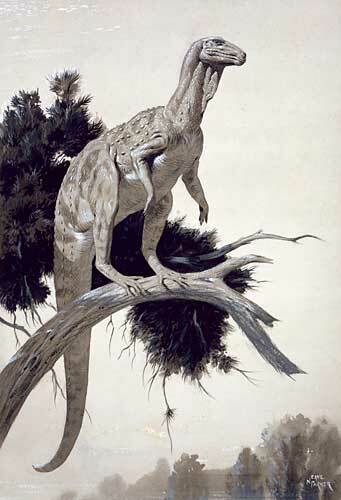 Illustration by Neave Parker from 1950 of Hypsilophodon using its toes to perch on a branch. It has since been determined they were more adapted to running on the ground. Photo from the London Museum of Natural History's online archives. Hypsilophodon had relatively long, powerful arms, and five fingers on each hand. The fifth digit of each hand angled differently, forming a sort of opposable digit, which could have helped to grasp things, like plants, in life, like the thumb of a primate. The stiffened tail was an adaptation for agility, and would have allowed the dinosaur to make sharper turns when on the move. Ossified tendons in the tail are an adaptation which were common to many other kinds of dinosaurs, like the hadrosaurs, and predatory dromaeosaurs. Hypsilophodon had a short, sharp beak in the front of its mouth for clipping tough vegetation. It's teeth were flattened laterally, leaf-shaped, for shredding food. Hypsilophodon also had small, pointed teeth in the very front of its mouth, just beyond the tip of the beak. These teeth were found in a number of other kinds of small, plant-eating dinosaurs, and may have aided in stripping leaves off of branches. Hypsilophodon also had extremely large eye sockets, suggesting its eye sight was probably quite good in life. In front of each eye, it had a palpebral bone, or "brow bone". These bones are also present on modern crocodilians and certain kinds of birds, and give the animal a superficial "angry" appearance. Their primary purpose was probably to cut glare and shade Hypsilophodon's eyes in life. 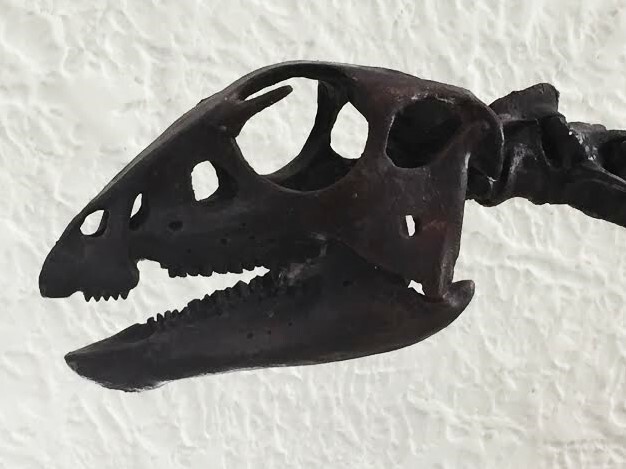 Close up of the Hypsilophodon's skull at the American Museum of Natural History. Note the palpebral bone growing from the front of the eye socket. Also check out the short beak and small teeth. There is a bit of debate going on right now as to what kind of skin covering dinosaurs like Hypsilophodon would have had when alive. For a long time we just assumed they were covered scales, but recently there has been more and more speculation towards it having had feathers, or feather-quill-like structures when alive. This is partially fed by discoveries of not only theropod dinosaurs, of which we know for a fact many of had full coats of feathers, but also certain kinds of early ornithiscian dinosaurs being discovered with feathers or coarse, quill-like structures on the fossil specimen's body. Specifically these dinosaurs are Psittacosaurus, a very early relative of ceratopsians, Tianyulong, a kind of heterodontosaurid, and Kulindadromeus, a more basal ornithiscian. 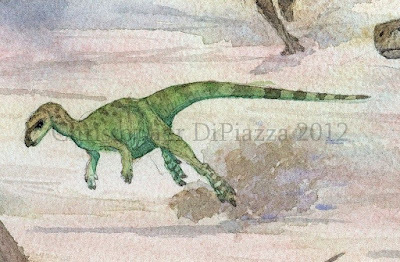 Now although these three specimens are indeed more closely related to Hypsilophodon than the feathered theropods...they were still farther away from it on the family tree than the ornithopods, of which many have been proven to have had scaly skin. So was Hypsilophodon purely scaly like its closest relatives, or did it have some extra fluff like other smaller dinosaurs? The exact body covering of Hypsilophodon is still very much a mystery! Sketch I did of how Hypsilophodon may have looked if it had feathers. Mayr, G.; Peters, S. D.; Plodowski, G.; Vogel, O. (2002). "Bristle-like integumentary structures at the tail of the horned dinosaur Psittacosaurus" (PDF). Naturwissenschaften89 (8): 361–365. Norman, David B.; Sues, Hans-Dieter; Witmer, Larry M.; Coria, Rodolfo A. (2004). "Basal Ornithopoda". In Weishampel, David B.; Dodson, Peter; and Osmólska, Halszka (eds.). The Dinosauria (2nd ed.). Berkeley: University of California Press. pp. 393–412. ISBN 0-520-24209-2. Sues, Hans-Dieter; Norman, David B. (1990). "Hypsilophodontidae, Tenontosaurus, Dryosauridae". In Weishampel, David B.; Osmólska, Halszka; and Dodson, Peter (eds.). The Dinosauria (1st ed.). Berkeley: University of California Press. pp. 498–509. Zheng, Xiao-Ting; You, Hai-Lu; Xu, Xing; Dong, Zhi-Ming (19 March 2009). "An Early Cretaceous heterodontosaurid dinosaur with filamentous integumentary structures". Nature 458(7236): 333–336. I suspect hypsolophidon had a mixture of feathers and scales like kulindadromaeous.